A loud, proud and classy dread offering serious credibility, quality and tone. Just make sure you bond with the flattish neck profile. Superb strumming and flat picking tones. Excellent build. The neck won't be for everyone. Guitar giant Fender acquired Guild in 1995, and has certainly taken its time re-establishing the model line and brand. 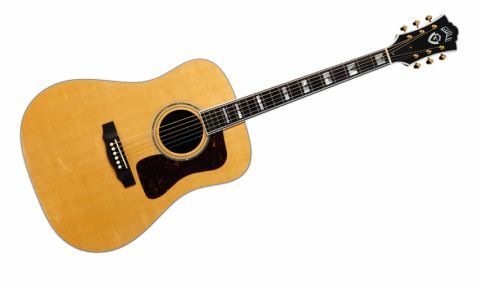 Initially built in Corona, California, then moved to the old Tacoma factory in Washington State, Guild has eventually found its new home somewhat closer to its original roots in New Hartford, Connecticut - and that's where this premium Traditional D-55 dreadnought hails from. The D-55 is Guild's dreadnought, very similar in shape to the all-conquering 14-fret Martin on which it's based, loved the world over as the true acoustic all-rounder - characterised by deeper bass, less accentuated mids and slightly more sparkling trebles than a smaller-bodied guitar, all other things being equal. It makes them more pleasing strummers in general, but they also get finger- and flatpicked very successfully, too. "The D-55 has solid rosewood back and sides that, in theory, should bring some richness, depth and lower-midrange overtones"
The D-55 has solid rosewood back and sides that, in theory, should bring some richness, depth and lower-midrange overtones when compared with a mahogany body alternative. This is capped by a solid 'AAA' spruce top supported by scalloped red (Adirondack) spruce bracing. Red spruce is lighter and stiffer than the Sitka variety, so makes a lot of sense for bracing a top that needs to be light, strong and resonant. Some people like red spruce for the entire soundboard too, especially those with a hard pick attack, or players requiring maximum headroom and clarity. It can take a little bit of work to get the most from such a top, however, which is perhaps one reason that Guild has opted for the (usually) slightly more forgiving Sitka on this guitar. Compared to the lower-priced Standard Series, Traditional instruments have more ornate binding, ebony headplates, more abalone and mother-of-pearl inlays and gold hardware. Their more 'upmarket' billing also brings ebony fingerboards and bridges. We must just mention the high-quality faux-alligator skin case that comes with a Traditional Series guitar, too. It might sound cheesy when you describe it, but boy does it make you feel great walking into a gig: super-classy and very cool indeed. "There are plenty of people out there who just want an acoustic that's blissfully easy and comfortable to strum: this is it"
If your used to a handful in the neck, the D-55 dreadnought makes for quite the contrast: a gloss neck, and slimmer nut accentuating the neck's overall thinness; more a D than a C profile, to invite comfortable first-position chords, aided by an impressively low action. Fingerstylists who like to dig in will find it all too cramped and easy, but there are plenty of other people out there who just want an acoustic that's blissfully easy and comfortable to strum: this is it. It makes a good flatpicker, too, with more midrange attack than we were expecting. Perhaps that Adirondack bracing is doing its job, because string separation, definition and dynamic range are all notable. It feels loud, alive and resonant when playing soft or hard, which are things you might say more commonly about a lightly built mahogany dread, though that rosewood warmth and depth is certainly there. Aggressive strummers will need to put a little more relief in the neck in order to get those strings really moving, and let the thing sing out. It's a genuine pleasure to hear, see and feel Guild at the top of its game. If this guitar is anything to go by, the latest Traditional models are absolutely up there with the other big American names, offering superb quality craftsmanship and world-class tone. Any criticisms we could level are purely subjective in terms of aesthetic or personal tonal biases: and besides, we're genuinely struggling to think of any. The D-55 is a potentially serious workhorse that has every likelihood of outlasting and outperforming any one of us as long as we can keep on picking - a sumptuous strummer.